A bit lost in the tornado of Trump and ST3, King County unanimously passed its $11B 2017-2018 budget yesterday. 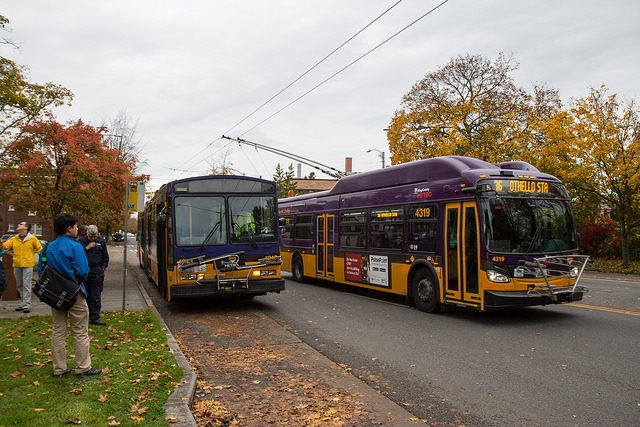 As we wrote about in September, the budget restores Metro’s capital program, provides 300,000 new bus service hours, hires 213 new bus drivers, and prepares Metro to implement the Metro Connects Long Range Plan. The Metro portion of the budget is $1.6B for the 2017-2018 biennium. Dow’s budget (unusually) included specific route allocations for the non-Prop 1 service hours, and in a welcome departure from past meddling, the Council mostly left them alone. Any increase in service hours greater than 25% would require Council approval by ordinance, but Metro is free to add fewer hours ‘administratively’ as it deems appropriate. Transit’s operational capacity to add 323,000 hours of service is affected by several limits. Prior staff reports discussed how base capacity constrains the addition of buses to about 100, the number identified with the proposed 323,000 hour addition. Other factors include the risk that trips might be cancelled because vehicles or operators are unavailable; the need to fill 100 operator vacancies and recruit 1,000 trainees to meet attrition and support new service; limits on available fareboxes and ORCA equipment for additional buses; and a backlog of vehicle service preparation that is projected to last through the biennium. Increased funding for the King County Marine Division, which operates the West Seattle, Vashon, and (soon) Bremerton Water Taxis. Ridership and performance will also now be analyzed like any other route through the Service Guidelines process. A proviso requiring King County to study either eliminating the $5 ORCA card fee, or adding $5 in value to all newly purchased cards. A report to Council will be due in February 2017. So if I read this correctly, Due to the sale of the property by Fall of 2018 CPS will be closed entirely for both passenger service and coach layovers? What does the Interim access mean? What are the plans for laying over during the construction and after the closure as I see the interim hours go away? End of Joint Ops is in Fall of 2018. After that the DSTT will be rail only. Once that happens ST can interlined a second LR line and go to 3-min headways in the tunnel. I was hoping for Spring of 2018, but at least there is a schedule now. For those among us too lazy to look up the PDFs, could we get a breakdown of what the Service Level increases will do? I assume most of them are just filling in gaps and corners of the schedules — earlier first trips etc — but a couple of suburban routes will get significant boosts (a fact which I trust suburban-equity watchdogs will take note of). I’m surprised not to see any new hours for the 40. I’ve heard, anecdotally, that it’s packed and unreliable outbound in the evenings. I thought the deal with Prop 1 is was they weren’t going to count those funds against Seattle And give more to the suburbs. I hate to be a negative Nancy but I kinda figured that would happen. Well precedent is clear for suburban voters– vote no, then let Seattle tax itself for the suburbs. Brad – the County’s investing in some of the existing Prop One routes as well. That’s the $39,710 figure: Prop One money replaced by county funds, thus freed up to invest in still more service. Does that have anything to do with the 40 becoming a RapidRide through Move Seattle? I also noticed that the 44 doesn’t have any additional hours, which is also becoming a RapidRide. At least for the 44, turning it into a “RapidRide” or “BRT” (or whatever terminology SDOT/Metro concoct) is years off, if it ever happens. You can bet the Wallingford business association is going to fight any loss of the publicly-provided street parking they consider their own tooth and nail. I don’t see any way to make the improvements SDOT proposed for the 44 without displacing basically all the street parking on 45th, or making the street one way for general traffic. The 40 is packed every time I’m on it. And its always late. I’d like to get a feel for what these hours mean. Here’s my estimate, but someone else please correct me if I’m wrong. 1 year ~ 250 weekdays. 1000 hours = 4 hours / weekday. Assume an average route is 1 hour from terminus to terminus. 4 hours in a day gets 2 round trips. So each 1000 hours = 2 extra trips in each direction. So if the 373 is getting 4800 hours, that would mean roughly 10 trips are being added each direction? Less if the hours are being used to make existing trips more reliable. * Requires changing a 73 to 373 (or adding service to the 73 instead of 373). This is a game changer for me. Suddenly bus trips to Fremont, for example, become a lot closer to driving. Ten minute frequency is very close to not using a schedule. It certainly cuts down dramatically on the transfer penalty. I’m not sure if it is what I would do to this route, let alone the system. I personally would rather put a little more effort into getting 15 minute frequency on the evening routes (the 73) which would be trivial with this change. Basically, with those 10 trips, you could have 15 minutes service (with the 73 or 373) from 2:00 PM to 9:45 PM. Again, this is huge. It means I can hang out in Fremont until after 9:00, and then just take a bus to the U-District without worrying about getting stranded for 20 minutes. If this is typical for the system as a whole, the improvements will be enormous. If that’s the case, then why the heck is route 83 getting 300 hours? Isn’t that about doubling the number of runs (2 to 4/morning)? The stated reason is “reliability” – what kind of reliability problems could a bus that runs twice a day at 2AM and 3:30AM run into? Looks like my 181 is (speculatively) getting later Sunday service (last trip now is 8:45 PM), or maybe midnight weekday run. And 183 might be getting Sunday service, or at least a respectable service span on weekdays. This of course happens after I move out of Federal Way. I would have liked to see service span on the 903 extended back to 9:45 PM like it was before the 2014 cuts. It’s current last trip (7:15 PM) is in peak service territory. I don’t see the 312 bus addressed in this. I ride it daily and it is so packed they pass stops and turn people away. While I see other routes to downtown almost empty. Under reliability needs, I see 312X at 600hr. I’m assuming that 312X = 312, which is the number seen on the bus header. Is that assumption accurate? I concur with Jeff – I see crowded 312s even at 125th, almost as if everyone south of 145th knows what the ST3 522 BRT project means. Be nice if they would also study the possibility of letting the ORCA balance go negative up to the card purchase price, as done on the Compass card in Vancouver. I wish accounts in good standing could go negative up to a reasonable balance. This would mean that somebody who was waiting for their reload to be downloaded to the card could ride the bus without being stranded or facing a fine. Any card with auto-reload or which had been reloaded online would likely be settled up. Agreed. But I hope ORCA, v 2.0 has mobile payment that you can just pay over the phone right away and the issue is solved immediately. I’m happy the water taxis survived. Huge boost to tourism. Plus West Seattle needs ’em for commuting. Also the new Kitsap Transit cross Sound ferries are going to be contracted to the Seattle water taxi operators. I imagine that will provide them with some economy of scale and will provide some investment in the docks and other infrastructure. Agreed. Although I was against the Kitsap Transit POFF expansion; at least some braintrust, bulk purchase ability, and commonality is going to be there.